Contrast House explores the role of contrast in the modern renewal of a 120-year old home. Employing the use of contrast in a historic neighbourhood and as a means to amplify natural light, the design juxtaposes opposing elements to explore the relationship between light and dark, old and new. The owners, relocating to Canada from southern climes, hoped to brighten the dark, narrow house. Although the existing house possessed a south-facing façade, it was only 11 feet wide and due to a traditional Victorian layout, had no direct sight lines to allow outward views and access to light. As a result, the primary design challenge was to increase natural light in the space, accomplished through both physical and perceptual means. Physically, the long, narrow house was reorganized in plan and in section, introducing new sight lines to the expanded openings at the rear of the house and updating the layout for a growing family. Perceptually, contrast is used as a means to ‘brighten’ internal spaces without direct access to natural light. Contrasting elements are placed in proximity to visually intensify the natural light spilling down from the large openings above. Stacked vertically along the party wall from the basement to the third floor, a repositioned, porous stair improves the flow of light and sight lines. The stair’s open risers and direct proximity to full height windows at the top, allows light to bathe the house’s interior spaces. At each level below, the stair is delineated by a defining black element. Be it tall black bookcases housing the owner’s colourful collectibles on the ground floor, or a chalk board wall for play on the second floor, these bold, dark pieces, in combination with rich walnut floors and crisp white walls and ceilings, create contrast to produce an intensified effect. The monochromatic palette highlights the house’s architectural forms, and is animated by the family’s collection of colourful objects, furniture, art, books, and toys, as well as the original stained glass window and views to the outdoors. uploaded Contrast House through Add A Home. On the ground floor adjacent to the open living and dining room, a tall black bookcase defines the stair, housing the owners’ colourful books and small collectibles. The long, narrow kitchen, at only 11 feet wide, is delineated by the ‘tapas bar’ island, a wall of floor to ceiling concealed cabinetry, and a long white counter contrasting with a charcoal wall. The white walls of the master suite, located on the top floor of the house, reflect sunlight, allowing the room to be bathed in a natural glow. Integrated with the roof deck, a green roof provides a cooling effect for the upper floors and absorbs rainwater, preventing run-off. 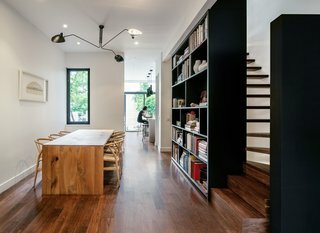 Walls were removed and a new open riser stair was stacked vertically along the party wall from the basement to the third floor, inviting light and air into the once light-devoid interior spaces. The marriage of interior and exterior, combined with meticulously conceived details and a restricted material palette, provide a continuous thematic quality throughout the project.